Well the weekend has flown by for me.. how about you? 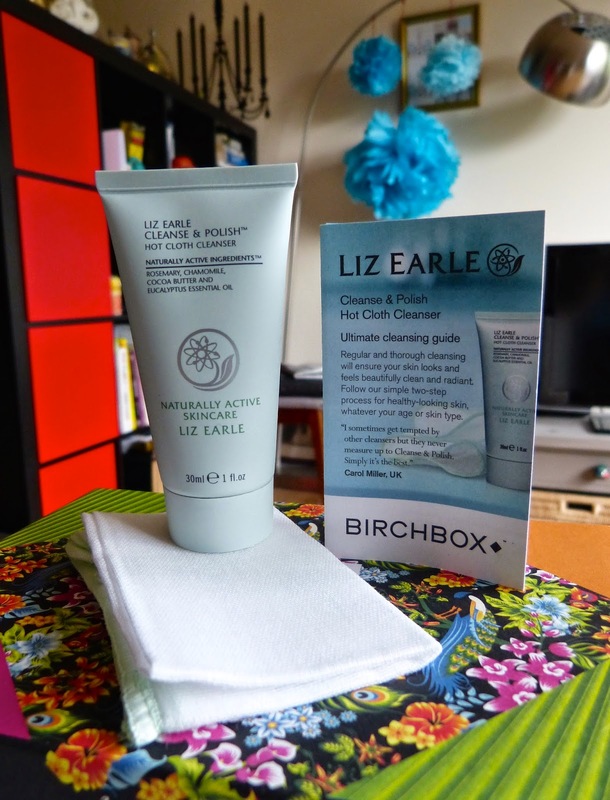 I had a nice surprise waiting for me on Saturday morning... my May Birchbox! This months box comes absolutely beautiful packaging. Its bright, summery and a hint of peacock design and generally just very cute! Thanks go to Harper's Bazaar for this one! Although this is only my second box I know from reading all your blogs and watching youtube vids that these collaborative boxes are always the best ones. This months is said to feature lifestyle and beauty products co-curated by the Harper Bazaar team. Inside the box as usual there is,what I like to call the menu card that tells me what surprises await (I avoid looking at this before opening!). Along with this comes an exclusive Bazaar offer card which gives details of the discounted subscription offer for Harper's Bazaar magazine- 76% off a 12 month subscription! Pretty good value at £1 per issue! I'm not on this occasion going to sign up though... I already have subscriptions to Elle and Glamour that I barely get time to read as it is! This months box also comes with a Bazaar beauty guide.. again much the same as the menu card it just tells you about the selection of products in the box along with a bit more detail as to why they were chosen to feature in the special box. It's great to have to look at once but no doubt this will end up in the bin soon. Not very enviro friendly Birchbox! Again, a useful little drawstring bag that holds all this months lovely surprises! I have no idea what I'm going to do with all of these, anyone got any ideas?! Yum... this oil smells so luxurious. As soon as I opened the parcel I could smell this little sample wafting through! With hints of pink grapefruit,rosemary and juniper berry its tangy and refreshing. I'll admit.. I haven't tried it fully yet (the post arrived just after I got out the shower!) but i popped some on the back of my hand and wow... this reminds me of being at the spa and being pampered, my skin was soft and felt hydrated. The price tag however.. £39 for a full size... I don't think i could justify spending that much.. but maybe once I've used it in the shower I might change my mind! Handy little duo! They are both Sulfate and Paraben free, suitable for all hair types and boast of being great at adding moisture,enhancing volume, adding shine,sealing cuticles, smoothing hair and being UV protective! Phew! Again, I haven't used these yet due to the bad timing of the postman. But... I've had a sniff and a read of the menu card! They don't particularly have a smell, if i had to compare them, slightly like the Aussie shampoo smell. I'll have a go this week and let you know! 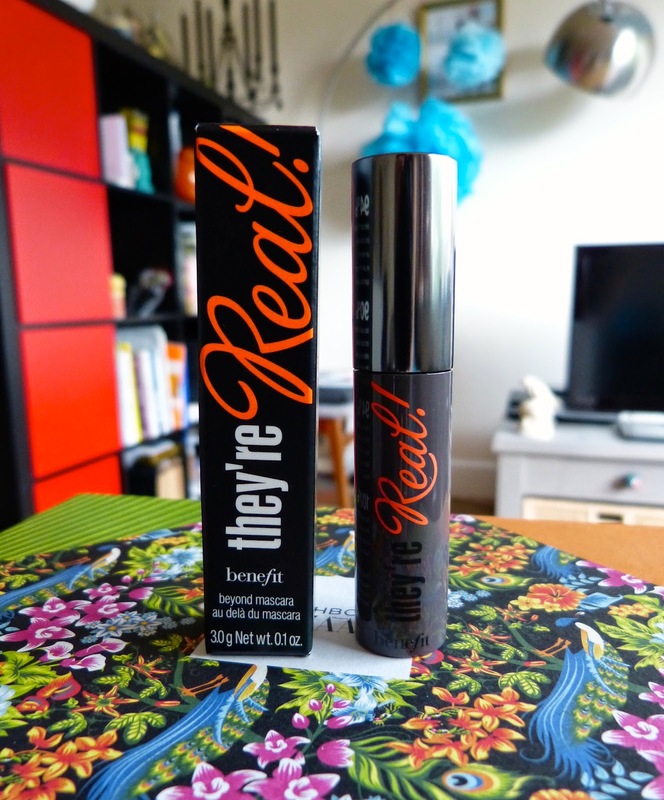 This is one of the most well known mascara's about.. and I can see why! 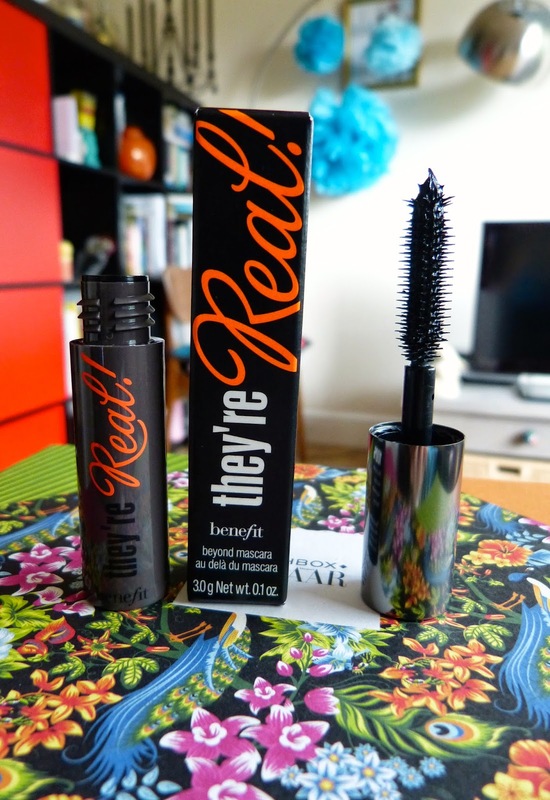 Its a jet black thick mascara that promises to provide separation and length without clumps...and that it does! I received the same sample in my Elle magazine a few months back and have been enjoying it. I like the plastic brush applicator and funnily enough it has saved me from buying another product. I'd seen a few blog posts about the Clinique Bottom Lash mascara and was tempted.. but when I tried They're Real! I didn't see the need to consider getting it.. the small brush with pointed end allows me to apply to my smallest lashes anyway! The only downside of this product is the fact its not so easy to remove at the end of the day... thankfully I have Lancome Bi- Facil which works pretty well but still needs a bit of a scrub! What a lovely product to find in this months box! If you are a reader of my older posts you'll know I bought a full size Cleanse and Polish set a few months back. I've loved using it and its lasting me so long that I think I'll either gift this one or pop it in my cupboard for later in the year! 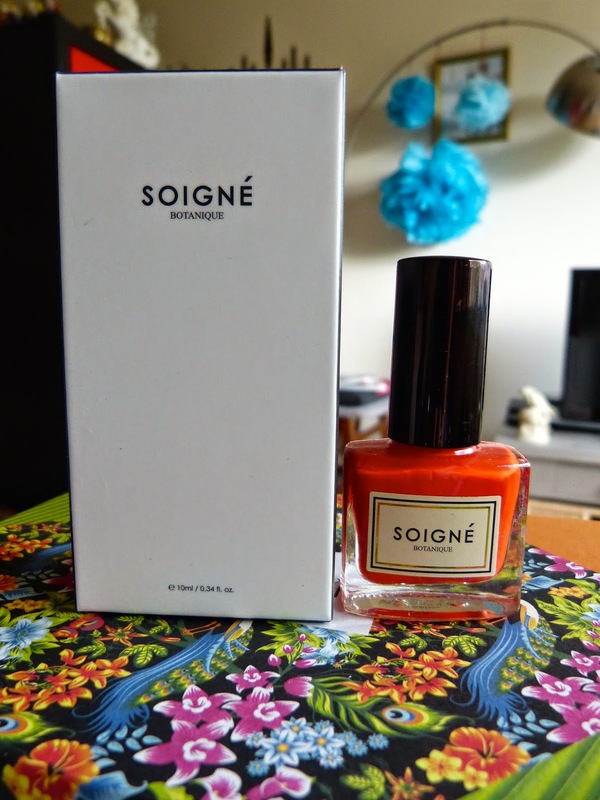 The French "Soigne" translates to "Very well dressed; well groomed" and I must say, the packaging lives up to the meaning. It came in a rather unnecessarily large box and was held in place by some somewhat pointless foam! I think something is happening to me.... I'm becoming quite conscious of the amount of rubbish I seem to be having to throw away after each box arrives! That being said... the nail varnish has really impressed me. A lot more than what I can say about the varnish in last months box! This time I did apply undercoat, I learnt my lesson yes. The varnish itself applies beautifully.. the consistency is thick but not gloopy and only needs one coat. I love the orangey-coral shade and the drying time was about 1 minute. Perfect for me as I always tend to find something completely ridiculous to do whilst my nails dry which means 99% of the time I end up with smudges all over my hands and my apartment! This months box does have a feel of luxury about it and that to me is the essence of Harpers Bazaar, the products hit the spot on that front. I loved the design of the actual box itself.. its a lot more exciting than the plain brown one from last month but I didn't really enjoy all the bumph that came in this box;the beauty guide wasn't much to shout about. This month I give it 4/5! Have you subscribed yet? What did you think to all the products this month? Do you have any recommendations of other boxes I should try?